A champion of contemporary music, Lisa Cella has performed throughout the United States and abroad. She is Artistic Director of San Diego New Music and a founding member of its resident ensemble NOISE. With NOISE she has performed the works of young composers all around the world. Lisa is co-artistic director of NOISE’s annual festival of modern music entitled soundON. 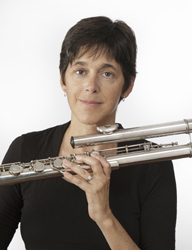 Lisa co-founded the flute collective inHALE, a group dedicated to developing challenging and experimental repertoire for two and three flutes. inHALE was an invited ensemble at the National Flute Association Convention in San Diego in August of 2005. She, along with Franklin Cox, is a founding member of C2, a touring flute and cello duo. As a soloist, she has performed both nationally and internationally and is a faculty member of the Soundscape Festival of Contemporary Music in Maccagno, Italy and Nief Norf based in Knoxville, Tennessee. Her undergraduate work was completed at Syracuse University and she received a Master of Music degree and a Graduate Performance Diploma from Peabody Conservatory. She received a Doctor of Musical Arts degree in contemporary flute performance at the University of California, San Diego. Her main teachers include John Oberbrunner, Robert Willoughby, and John Fonville. She is an associate professor of music at the University of Maryland, Baltimore County and a founding member of its faculty contemporary music ensemble, Ruckus.